Do you suspect your home has fallen victim to water leak that needs locating? Have you had a sudden surge in your water bill? Have you noticed water pooling up on floors, inside walls, or under carpets? Can you hear water constantly running even when all faucets are closed and off? If so, you’ve come to the right place! Flow Plumbing and Leak Detection in Mesquite TX is the go to plumber for water leak detection in Mesquite, Forney, Balch Springs, Sunnyvale, Dallas and all cities in the DFW area. Here at Flow Plumbing we have a long standing reputation as the leak locating experts in Mesquite, Texas. In fact, we handle a large number of leak detections for other local plumbing companies as well as for our own customers! The amount of trust other plumbers place in us to locate leaks for their customers comes as no surprise. This is because we have spent over 15 years honing the craft of locating water and sewer line leaks. When you dedicate yourself for so long, to something as highly specific as leak detection, you’re bound to become an expert in the field. If you are questioning whether or not you have a leak, the best option is to act fast and call out a licensed plumber to perform a leak test. Give us a call today 214-388-8838 we’re fast, affordable and most importantly accurate! We can let you know in as little as 60-90 minutes whether or not you have a leak, and pinpoint within 3 feet of where it is in your homes water or sewer line. If you notice any of the above signs of a water leak in your home or business it is imperative that you call out a plumbing professional as quickly as possible to perform a water leak detection or hydrostatic pressure test in Mesquite. Give Flow Plumbing a call and we can determine the presence of a leak, pinpoint its location, and provide options for repair. There is a reason we are the DFW’s go to leak detection company. Call us today at 214-388-8838 we’re standing by ready to help! One of the most common types of leaks we locate are water leaks that have occurred under a slab. Our fast & affordable slab leak detection service in Mesquite will not only quickly determine whether a slab leak is present but will also pin point its location. Accurately locating the source of a slab leak is one of the single hardest aspects of leak detection. Leaks under a slab are hidden from the naked eye and take both specialized listening equipment, and a highly trained plumbing technician to find. The combination of machinery and plumbing expertise is not something that is easily taught. Rather, it is learned in the field through constant practice and patience. Here at Flow, we have perfected this process. This is why so many homeowners and plumbing companies alike trust in Flow Plumbing and Leak Detection in Mesquite to locate their slab leaks. When time is of the essence and leaks must be found and fixed fast, Go with the Flow! To schedule your slab leak detection in Mesquite, Forney, Sunnyvale, Balch Springs, or any surrounding city, give us a call at 214-388-8838. We’re standing by ready to help! When it comes to locating a water or sewer line leak, we’ve got you covered but, what do we do once we find it? Simply put, we fix it! Our slab leak repair service in Mesquite is second to none at quickly and affordably repairing slab leaks. In fact, we show up to every slab leak detection job with the tools and time to perform the repair as well! This not only saves you time, but also money by working with one company who is skilled, and prepared as well as licensed to perform plumbing repairs in the State of Texas. Don’t waste your valuable time hiring one company for one thing and another company for another. Pick a company with a reputation for locating slab leaks quickly and repairing them effectively. 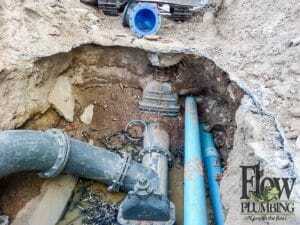 Choose Flow Plumbing and leak detection to perform your slab leak repair in Mesquite. You’ll be glad you did!